The Global Combustion Oil Flow Control Valve has a straight line characteristic, in that the flow is directly proportional to the angular position of the throttle lever over the operating angle of 60 Deg, irrespective of the valve setting for maximum required flow. 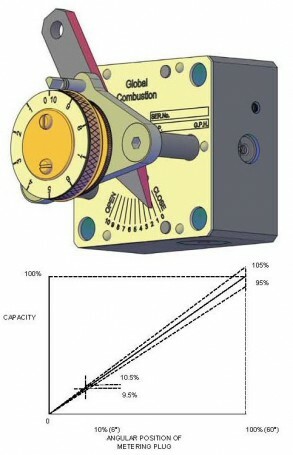 This unique characteristic is achieved by the throttle lever having a parallel sided slot specially designed to eliminate any increase of frictional losses with an increase in the oil flow. As the slot area increases in direct proportion to the angular movement of the throttle lever, together with a pressure compensating feature, which maintains a constant pressure differential across the valve, the linear characteristics are repeatable over a 10:1 turndown ratio. The OFCV valves are manifold mounted, making it easier to remove for maintenance. A single valve can be controlled manually or independently, with the fitting of either an electric or pneumatic actuator. Multiple valves can be linked together to one actuator providing the facility to set independent max flow capacities. The common actuator simultaneously adjusts the flows of these valves maintaining a 0 to max flow across all the valves. Global Combustion Systems can also provide auxiliary equipment including a complete fuel oil control system, with full supervision and commissioning services.